GAIN FLINGS LAUNDROMAT TAKEOVER- See you there! Houston! I have been a Gain lover for years and years that is why I am excited to be a part of the Gain flings! Laundromat Takeover with special guest JJ Simmons from 97.9 The Box! Gain flings! is bringing a whole lot more scent to the laundry room experience so if you guys have laundry piled up in a basked; bring it out and do it this day with music, activities, and giveaways through the day and the best part is you get to experience the #BestScentEver! People who have tried the new scent LOVE IT! What are Gain flings; you ask? Gain flings are easy to use laundry pacs that bring 50% more recent to your laundry room and your clothes. The Oxi boost fights stains while odor are removed with the odor elimination technology of Febreeze, so your clothes are left wonderfully clean and with an amazing scent! 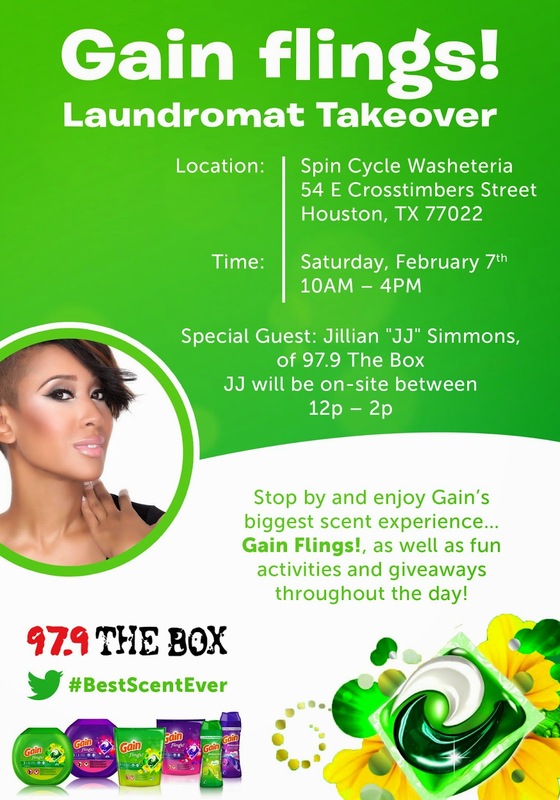 JJ Simmons of 97.9 The Box will be on site from 12-2pm - she would love to meet you and give you some Gain swag! I will be there from 1-2pm covering the event and filming all the action; stop by and take a selfie with me too! !